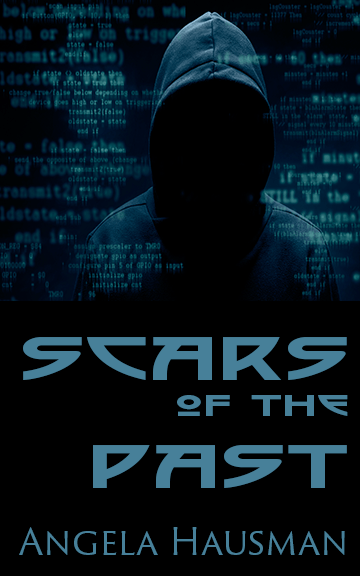 Scars of the Past, Dark Web #2 launched on Tuesday of this week and next week I’m hosting a launch party on Facebook and everyone is invited. The party is Tuesday, August 1 from 6-8 pm EST. Just pop on over to the Facebook page and spend all 2 hours or pop in and out as your schedule allows — and it’s the perfect commercial break. There’ll be lots of fun and shenanigans, plus, you can come in your PJs — no pants required. I’ll read an excerpt from Scars of the Past, or maybe 2. There will be chances to win a free ebook and 1 lucky winner will get a signed print copy of the book. I’ll have quizzes and games, in fact, the first quiz is already up on the launch page to whet your appetite. As a special bonus, I’m offering a sneak peek at the next book in the Dark Web series, Azure’s Revenge. If you thought Scars of the Past was dark and scary, just wait until you get a taste of Azure’s Revenge, which releases in Oct. 2017. While these books aren’t traditional horror books, they’re even scarier because the murder and mayhem could really happen. I don’t need cars with supernatural powers or deranged killers out to chop up teenage kids. While these books aren’t traditional horror books, they’re even scarier because the murder and mayhem could really happen. I don’t need cars with supernatural powers or deranged killers out to chop up teenage kids. You’ll finish reading them and worry about what’s going on in the dark web and how devices we count on every day can lead to murder. One reader threw her Fitbit away after learning how a killer used it to track his victim down on her run. If you’ve never been to a book launch, you’re in for a treat. The increased popularity of online book launches comes from 2 complementary factors. First, folks don’t want to fight traffic and deal with parking issues after a long day of doing the same thing at work. They want to sit in their living room and relax with an adult beverage. An online book launch is the perfect way to have fun without leaving your cozy spot. And, you can use any device: your computer, smartphone, or digital TV to join the fun. Second, online book launches are expensive for everyone. You have to feed everyone and give them something to drink. The bookstore has to stock copies of the book and hope they all sell (and that they don’t run out). As attendees, you have to spend money on gas and parking, plus your valuable time. With an online launch party, there’s no commute time, no time spent finding parking, and you can pop in for a few minutes whenever you want. Stay the whole 2 hours if you want. It’s up to you.